Leonidas Kavakos performed the Sibelius with the San Francisco Symphony. San Francisco Classical Voice: "Kavakos stripped this extravagant work of all indulgences to deliver a lean, purposeful, and deeply absorbing performance. The sense that something different was about to happen was apparent right away. From a quietly insistent opening phrase to an early cadenza, Kavakos staked out his territory with a woody, fibrous tone – reminiscent of a fine baritone’s probing, amber-toned voice – that seemed to stride into the score instead of sailing across its swooping surfaces." San Jose Mercury News: "...the performance simply failed to cohere. Kavakos is an undeniably skilled musician, and his lustrous tone and facility in the score's challenging passagework were evident. But it was hard to escape the sense that he and Thomas never quite saw eye to eye on matters of tempo and emphasis." San Francisco Chronicle: "It was an awkward, unpersuasive performance, wayward of pitch and rhythm and marked by what seemed like the violinist’s utter indifference to what the orchestra was doing at any given moment. Thomas’ efforts to keep everyone together were practically poignant." 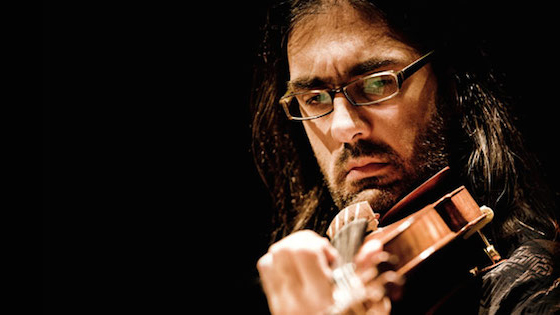 Terez Mertes, Violinist.com: "Kavakos had found that place of haunting, bittersweet beauty, where technical brilliance meets vulnerability, and he played the concerto, particularly the second movement, from that space." Tai Murray performed the Sibelius with the Duluth Superior Symphony Orchestra. Duluth News Tribune: "The masterful performance of guest violinist Tai Murray had the locals jumping out of their seats, and that was after she had played just the opening movement of the Sibelius Violin Concerto." Zehu Victor Li performed the Sibelius with the Allentown Symphony Orchestra. The Morning Call: "The Sibelius concerto is a virtuosic musical storm through which Li, at 18 the youngest-ever Schadt winner, piloted his way with striking finesse. Even at a young age he commands all the trappings of a seasoned artist — a richness of tone, a finely crafted musical line and the apparent nonchalance that only the finest performers seem to muster." Sergey Khachatryan performed the Beethoven with the Los Angeles Philharmonic. Orange County Register: "He played it beautifully, with a gorgeously full and silken tone, in long, singing, connective phrases, but on Saturday he seemed to broaden a phrase whenever possible and to stop to smell every rose along the way. His reading clocked in at 48 minutes, several longer than many and, at any rate, too long here. Pick up the pace, just a tad, young man." Vilde Frang performed the Brahms with the Royal Scottish National Orchestra. EdinburghGuide: "Vilde Frang gave us a superb performance, and the audience loved it." Tianwa Yang performed the Brahms with the Florida Orchestra. Tampa Bay Times: "Yang's palette is vibrant. She handles every part of the instrument, on every level of intensity. She attacks entrances fearlessly and stretches interpretation to something beyond a command of the material." Yoonshin Song performed the Khachaturian with the Detroit Symphony Orchestra. Detroit Free Press: "(Concertmaster) Song's impeccable but unforced technique, long-breathed phrasing and full-bodied sound — espresso rich and powerful enough to cut through the orchestra or soar above it — were all perfectly suited to the music's songful lyricism. You could bring in many of the star violin soloists on the circuit to play this concerto and not hear a more compelling performance than what Song delivered." Isabelle Faust performed the Schumann with the Royal Liverpool Philharmonic. The Guardian: "Whether or not you give credence to its supposed rediscovery in a seance, Schumann’s long-suppressed Violin Concerto finally seems to be gaining a toe-hold in the repertoire. Isabelle Faust is one the piece’s most eloquent advocates, though her recent recording divided opinion, owing to the quixotic decision to perform it with a baroque orchestra. Petrenko’s gossamer accompaniment ensured that Faust’s filigree lines were always audible and the concluding polonaise danced where it is wont to drag its feet. Reintroducing the shimmery vibrato suppressed on the recording, Faust sounded far more at ease with a symphony orchestra playing softly than a period band scrubbing hard." Christian Tetzlaff performed the Lindberg with the London Philharmonic Orchestra. The Guardian: "Christian Tetzlaff’s imperious playing of the piece was edge-of-the-seat compelling from first to last, brushing all uncertainty aside. From the high, rapt opening to the scintillatingly vigorous finale, Tetzlaff played with a vehement authority that never wavered, and at times was almost overwhelming." James Ehnes performed Prokofiev's Violin Concerto No. 2 with the National Symphony Orchestra. The Washington Post: "He executed the solo part effectively without actually being spectacular in it, with a few moments when, despite Noseda’s notable restraint, he was actually hard to hear. The overall result was a reading that felt slightly distant; the third movement, from both soloist and orchestra, lacked the sense of vitality and bite that characterizes so much of Prokofiev in his up-tempo mode."